• Personal planning tailored to your situation and goals; no cookie cutter plans. • Hourly, Fee-Only practice, to provide the best objective advice for your benefit; we do not sell securities or insurance. • Comprehensive view of your situation, even if we only focus on one or a few topics. • Services on an hourly basis, so you only pay for the advice you need; we do not charge a retainer fee or percentage of assets under management. • No asset or income minimums; professional advice is available to anyone. • Committed to the highest ethical and continuing education standards. The Financial Planning Association (FPA) is the membership organization for the financial planning community. Their members are dedicated to supporting the financial planning process in order to help people achieve their goals and dreams. FPA believes that everyone needs objective advice to make smart financial decisions. 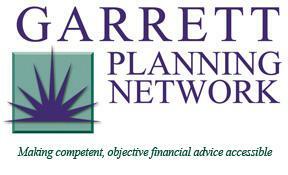 The Garrett Planning Network is the nation’s premier network of professional Fee-Only advisors dedicated to providing independent, objective financial planning and advice to people from all walks of life, on an hourly as-needed basis. Many other financial advisors accept clients only if they meet certain income and net worth requirements. Garrett Network members believe that professional, objective financial advice is something all Americans need, at least periodically, to build the brightest financial future.